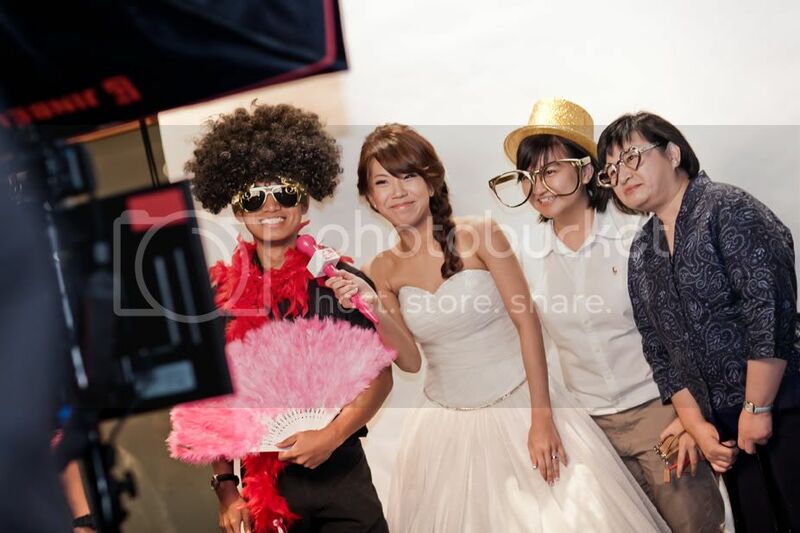 Here’s a video of my lovable and so-very-pretty secondary school friend’s actual day wedding. You can hear her giggling, which was practically what she was doing the whole day, that is why it is great to have videos on your actual day. It is one of the best experience I had this year working with her. 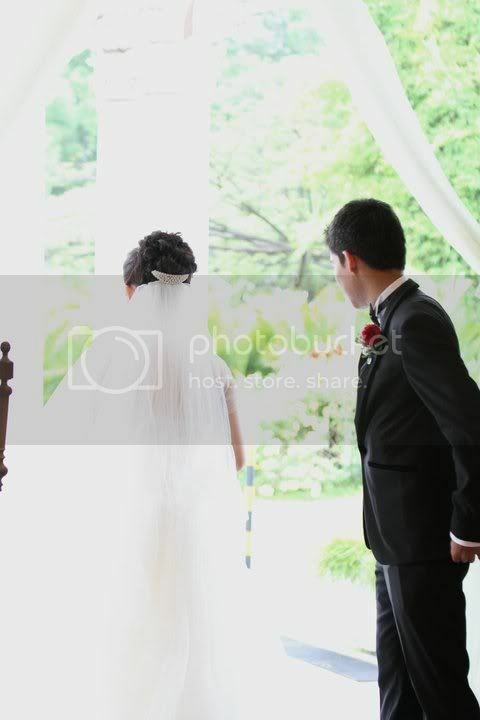 Don’t get me wrong, I kept saying I enjoyed working with my brides and everyone seemed to be great for me. This is extra special because I have known her since secondary one (and we got off the wrong foot) but became great friends till the end of secondary school. 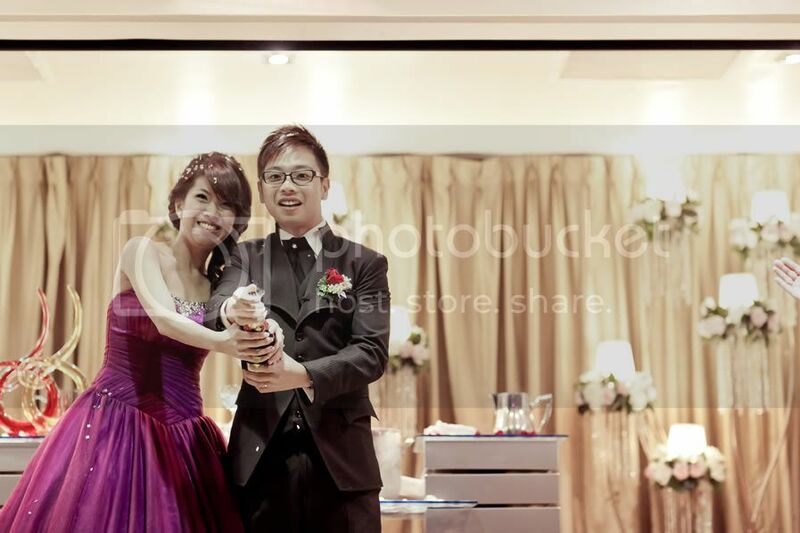 Looking back at the pictures we took after our ‘O’ levels at Sentosa, those innocent smiling and act-cute poses we had, I would never have guess that I would be by your side making you prettier and dressing you up (trying not to peep while you were changing) on your big day. Oh boy, aren’t you lucky? LOL, KIDDING! Getting all sentimental. But I will leave it till the pictures are up. It seemed like I am very slow in updating my blog again. October was such a busy month. My weekends were filled up to the rim. If I was not doing makeup, I was on the roads – dazed. 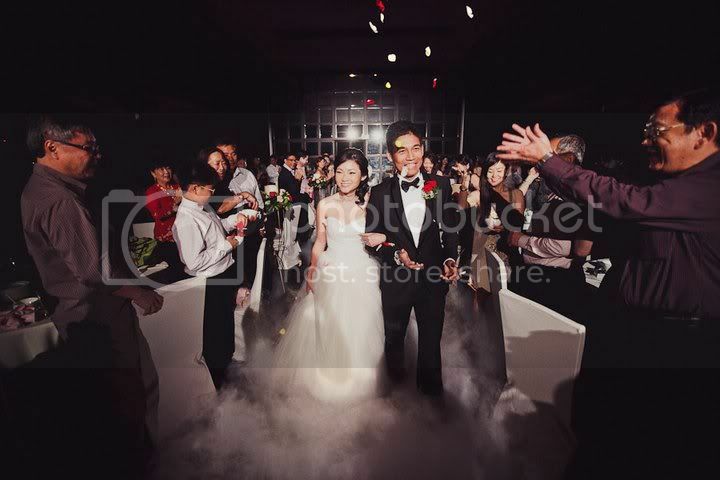 I am pretty sure lots of you had attended at least 1 wedding this October. I married off two friends in this month and it was so much fun. 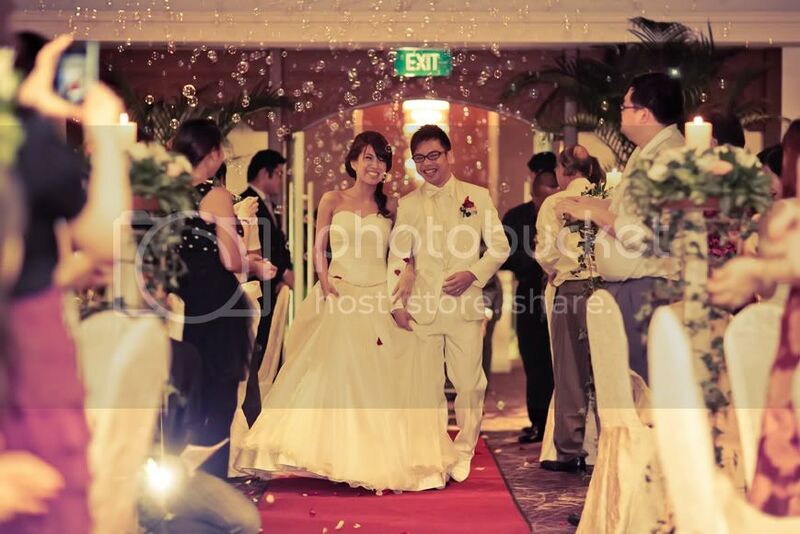 I sooo look forward to see their pictures as the photographers happened to be friends of mine too. Speaking of friends, I always get to make new friends from my job. 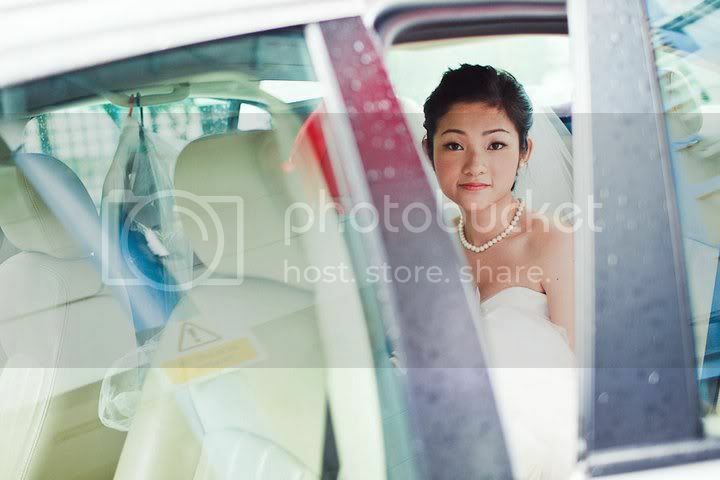 And Katharine is one bride whose friendship I really treasure. From our 1st awkward meeting to discuss about the hairstyles (remember the mood board?) till her makeup trial to her actual day, Katharine has always been very thoughtful, attentive and so very nice. 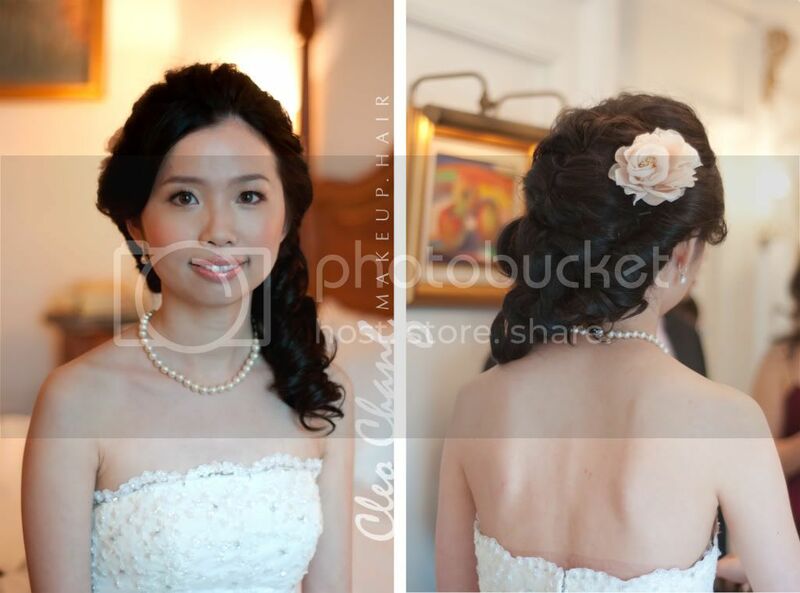 For her hairstyle, we settled for a cute princess-y hairdo to go with her princessy gown. But Katharine do have an edgy style so instead of the usual tiaras, we went for simple bling hairbands for her hair accessory. Evening is a more feminine side do. Katharine has thick coloured hair which is great for hairstyling. The curls gave alot texture for her hair. 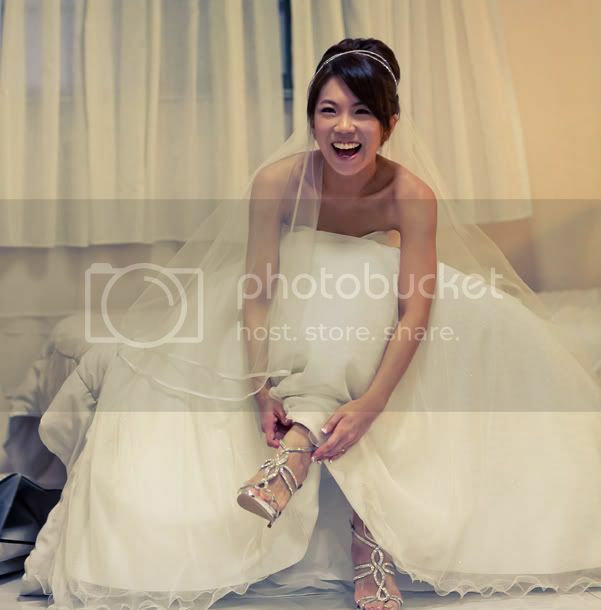 Gina’s actual day wedding highlights. 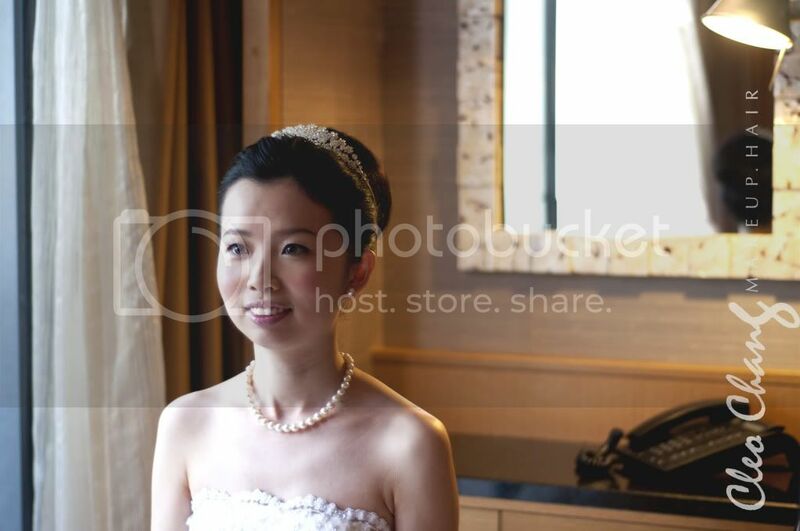 I nearly teared when I heard her vows. Her makeup is natural kept to a radiant look. I kinda like to see myself in videos. Wahahahaha. Reason being, photographs always caught me in some weird expression.Thank you Gina for giving me the link. It is a very lovely video. 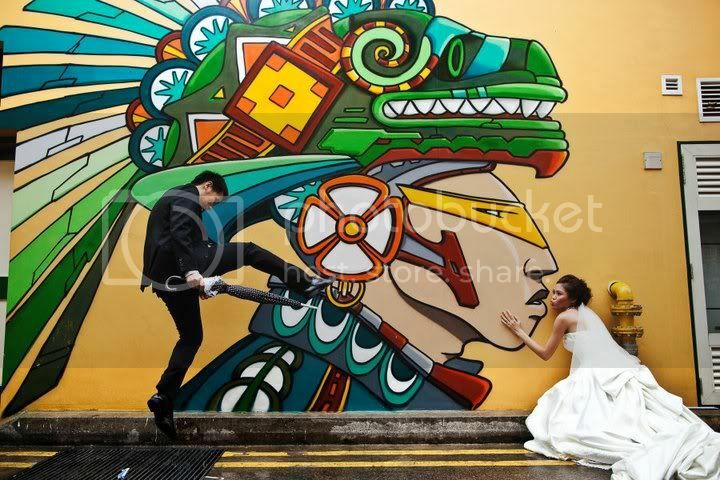 I really liked think its so romantic. Fiona has a very fashionable look and a wonderful figure. 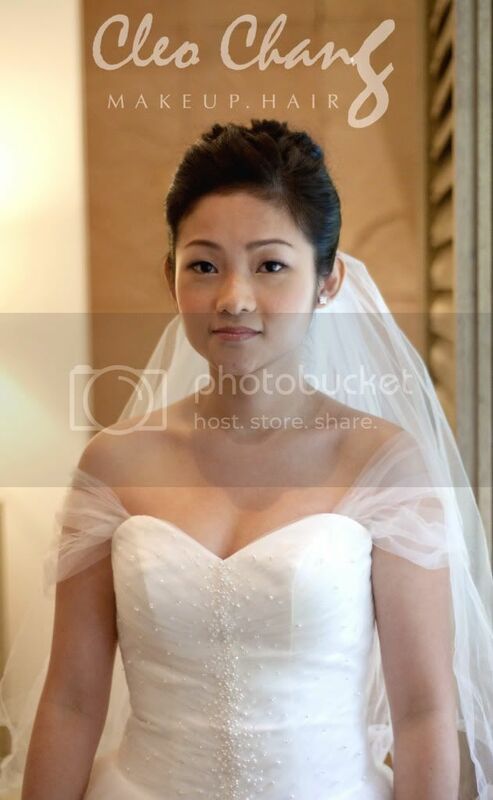 As she just required just 1 look, we need to have a hairstyle that suits her wedding gown and her cheongsam. I suggest an updo with slightly messy curls at the back of her head. 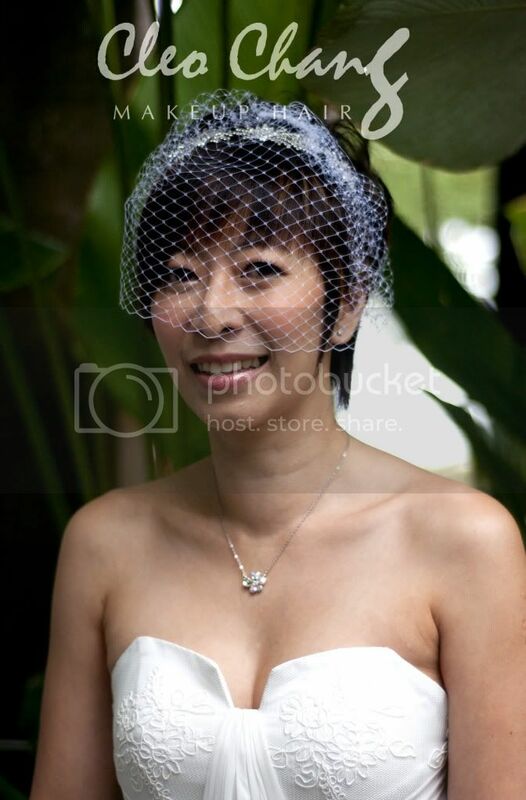 It will look great with the veil, with the veil continuing the flow of her hair. With her cheongsam, the hairstyle itself is as chic as it could be. It looks great without any accessory. Makeup is kept natural as per what I usually like to do. 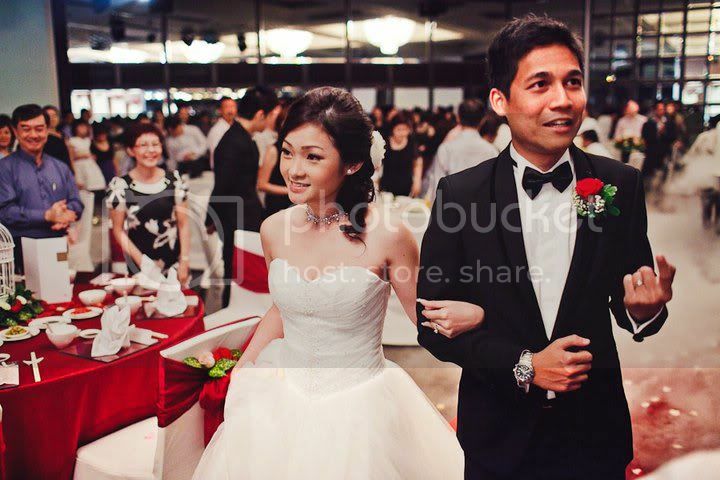 This picture shows the essence of the hairdo with her dress. Sizzling hot isn’t this picture? I enjoyed my sessions with Katharine. She is such an amiable bride and she blew my mind when she sent me the hair visuals in the form of a mood board – Very Martha Steward website feel. I did not manage to capture alot of pictures of her in the morning but as Katharine was in very capable hands, I believe you will enjoy her actual day wedding video as much as I do. Thank you Katharine for the video. I really look forward to see your pictures! 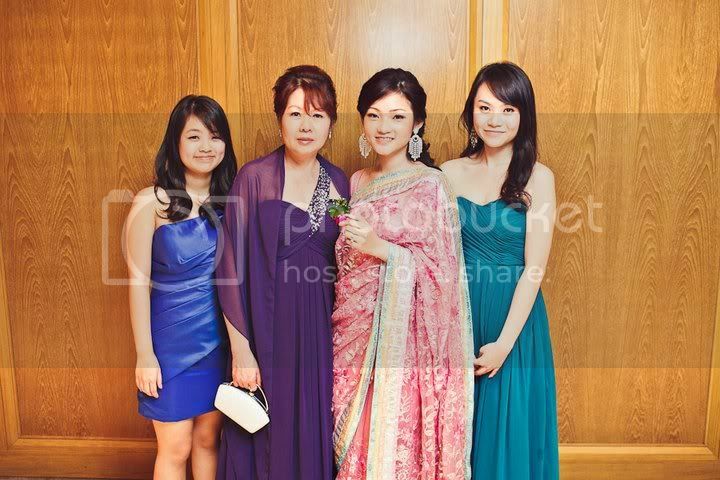 One of the more elaborate weddings that I participated in, starting from bridal day makeup to church to evening dinner. Christine had a different hairstyle for all 3 different segments which made it very interesting for me. 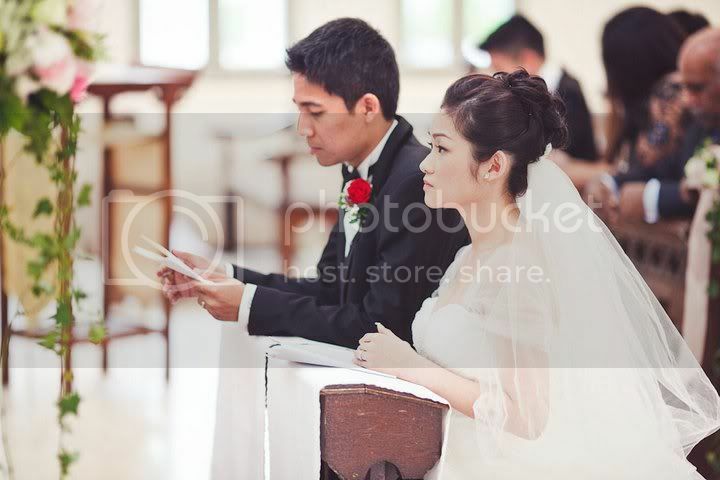 Usually brides will have the same hairstyle for morning gate crashing and church. This time, the veil is placed differently for both separate events, allowing more creativity to flow. Morning was a Korean-like twisted hairstyle. It was neat but interesting at the same time as thecurls gave more dimensions to her hair. 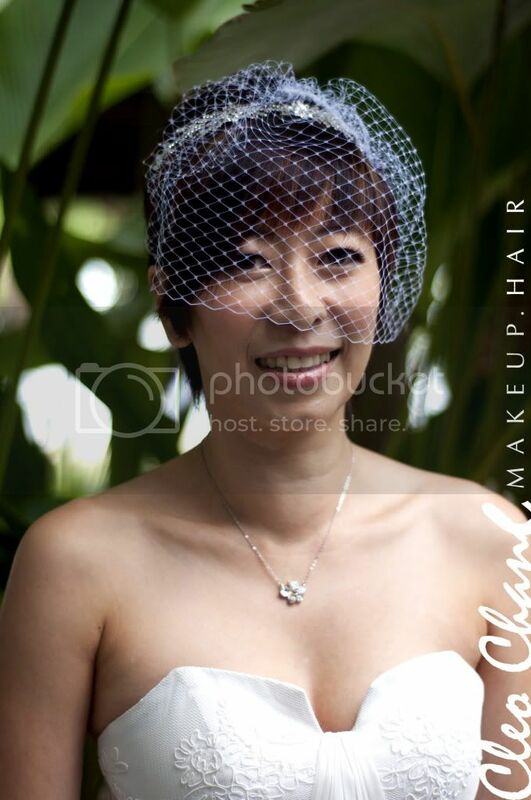 With such, we chose not to use any hair accessories, and just let the veil be its only accessory. 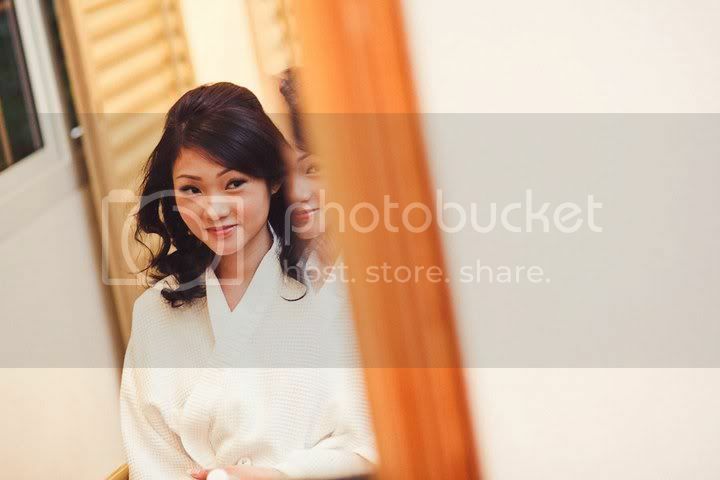 Makeup was kept natural as Christine has very sharp features. Just a slight rosy blush and lips. For church, we changed into a slightly more playful hairstyle. 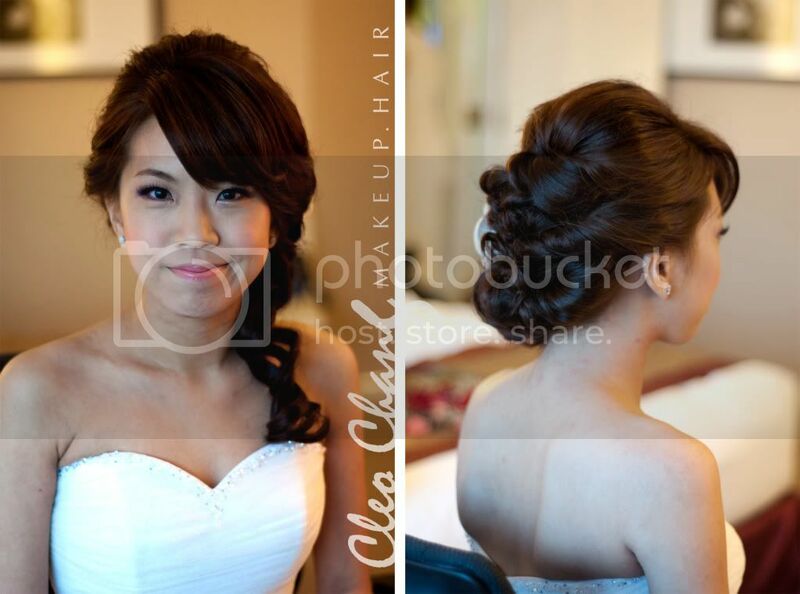 Unlike normal buns, Christine had a bun with curls for more texture, thus giving it a more youthful look. This is an example that not all buns are boring. 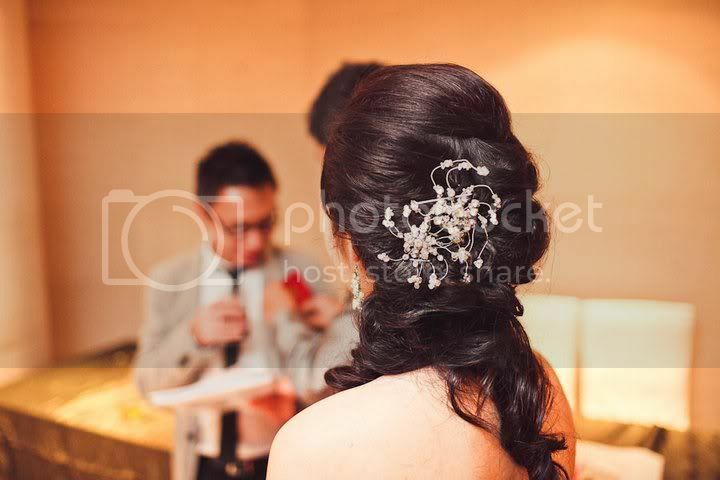 Since it is Church and everyone will probably see more the back of Christine head than the front most of the time, a tiny tiara is placed below the bun for a dazzling effect. Now comes the evening. A more smokey eye makeup is done for Christine with a mixture of plum purple and dark brown. Her hair was kept neat and left on the side for a softer look. Love how it looked with her dangling earrings and her Indian Sari. Thank you Christine for the pictures. Really enjoyed working with you. It was a breakthrough on my side to introduce another hairstyle that I never had done before. Love how it looked on you. It was a great hiatus since my last post, not counting the one I finally posted up yesterday after realizing I haven’t posted anything for 2 weeks. I was not exactly free. 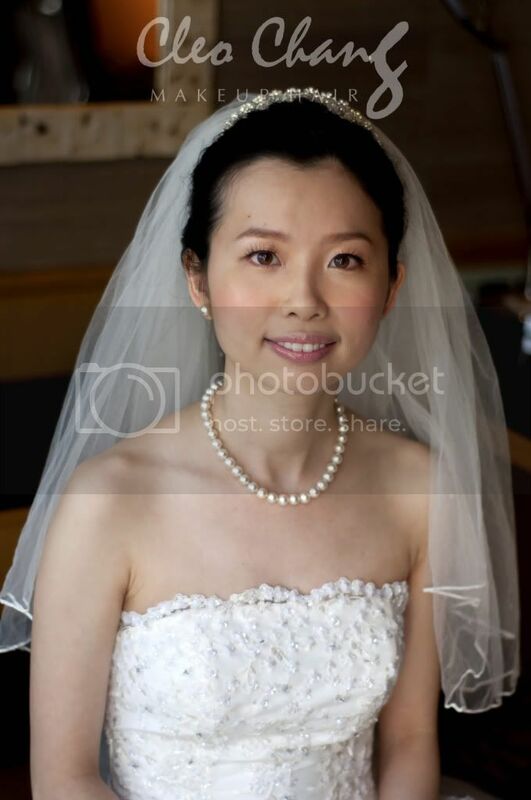 I thought I would be as it was the Chinese 7th month and all bridal assignments came to a stop. What I didn’t realize is the whole lot of hair trials I have to conduct in anticipation of the upcoming surge of weddings in September and October. I am still panic-kingly looking at my list of brides and trying to allocate hair trials slots to suit everybody. Since we are on this topic, let me talk alittle about my hair trials. 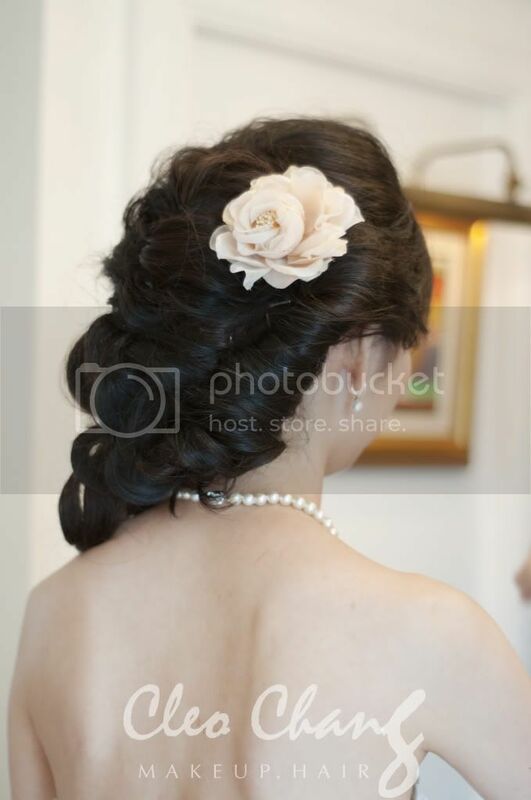 If you seen my package details, you will realize there is a complimentary hair trial in my bridal packages one to three.This hair trial is not transferable to other services. Now, why do I have this hair trial? I always thought hairstyles speaks volume to one’s character. Like, a some-what serious person would don a some-what serious hairstyle. This is like a rule coz that particular hairstyle suits her character. Think Edna Mode in “The Incredibles”. Her creators gave her blunt cuts to suit her no-nonsense business character. 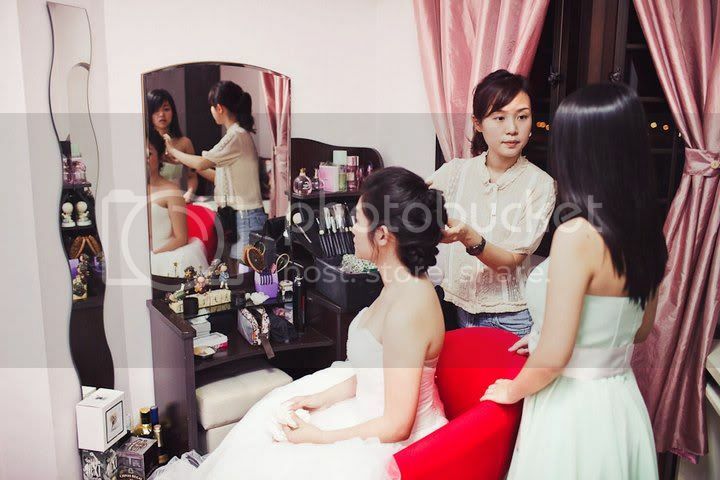 As the makeup artist and hair stylist, I have to take into considerations of the bride’s character and give her something that is suitable. A hair trial gives us a chance to bond and discuss over the hairstyles together, which I think is far difficult to achieve than makeup. I personally find hair trials though mind simulating are very tiring, as it spans longer than the actual day itself. So trust me, it is a really good deal. So with my weekends all used up for hair trials, this left me little time for myself after I come home from work. Yeah, I still have a full time job but this is besides the point. I am spending the few hours I have now watching this great comedy sitcom “The Big Bang Theory”. I have always been a great fan of comedy sitcoms. The last time I blogged about “Everybody Loves Raymond” which I am still watching repeats and it still makes me laugh. I think this is the only leisurely thing I can do with my supposedly “free time” and it thoroughly relaxes me. I have watched “Friends” for more than 5 times not by choice but coz they had always been on the 7pm time slots by which you can watch its re-runs repeatedly after you reach home from school. The next most watched re-runs would be “The Nanny”. Somehow the sitcoms nowadays are not as funny as the past. I failed to see how “Two and a half men” is funny. Anyways, I am very taken in with Sheldon Cooper, the main cast of “The Big Bang Theory” and the actor Jim Parsons himself. His eccentricities are just so endearing, and I guess I like him because I wish I could be like him. To be able to ignore the social obligations and live his life as he wants it to be. Plus he is really cute looking. I am talking so much about sitcoms because I think if you happen to like one of it, then we probably are of the same frequency. I am always thrilled when one of my brides happened to blurt out something like ” This is going to be legen -wait a min dary!” -from “How I met your mother. Or hymned to the songs of Glee. These happened before. I feel I known her for ages. The Audrey Hepburn look is exactly what I had in mind for Miin the first time I saw her. Her hair is bun-ed up in a high bun and completed with a tiara her mum had bought for her. 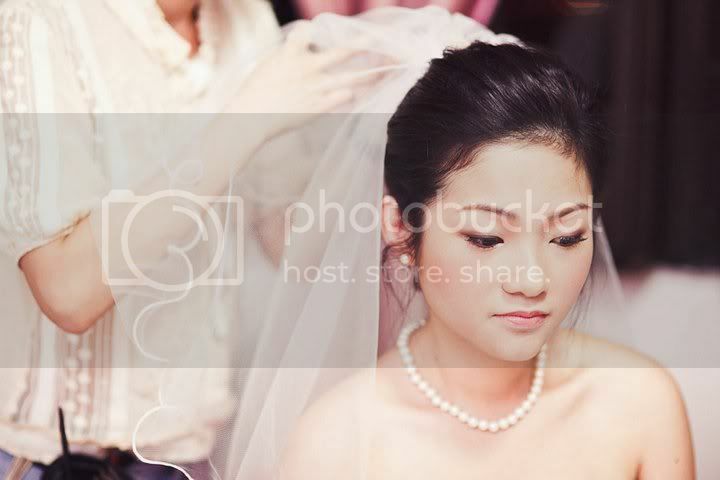 With the classic pearl earrings and necklace, Miin looked straight out of Audrey Hepburn movie. Even her dad remarked that, so I guess we were on the right track to elegance. Miin’s actual night look was a very unique look we came up with. She wanted something more feminine, soft and sweet. I gave alot of volume and curls at the back of the crown and have her hair let down to the side. 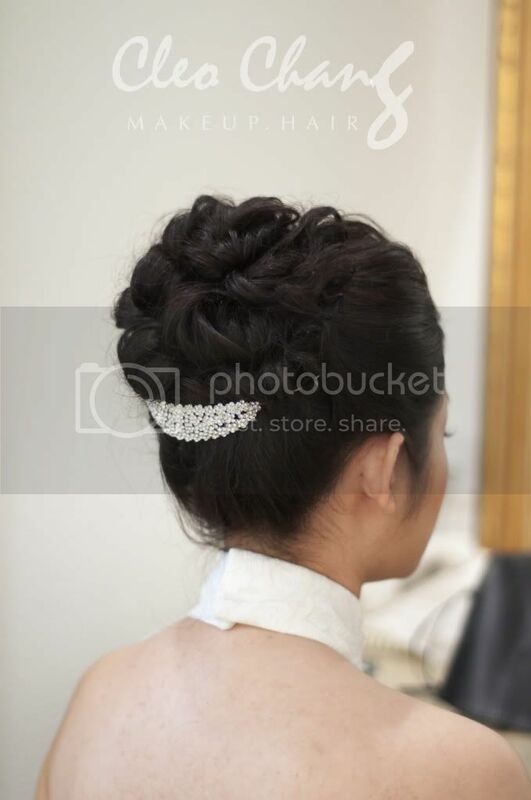 Usually Singaporean brides prefer hairstyles that are lighter so I am extremely lucky to work with Miin who preferred more volume, thus allowing me to create this one of the kind hairstyle. Her makeup is slightly stronger for the evening, highlighting her eyes and giving her a peachy blush.